Fungal pathogens are increasingly recognized as drivers of wildlife declines yet our understanding of the ecology and evolution of host-fungal interactions remains poor. The amphibian chytrid fungus, Batrachochytrium dendrobatidis (Bd) is one of several emerging fungal pathogens identified as key threats to wildlife. Bd has been linked to declines of frog species worldwide and appears to be an important contributor to the ongoing amphibian extinction crisis. Work in our lab has contributed to our understanding of the distribution of this pathogen (Zellmer et al. 2008, Lehtinen et al. 2008, Brannelly et al. 2012, Chatfield et al. 2012) and its effects on host fitness (Chatfield et al. 2013), including the recent discovery of Bd’s occurrence and pathogenicity to non-amphibian hosts (crayfish: McMahon et al. 2013, Brannelly et al. 2015). Our work has also yielded insights for captive management of species threatened with extinction by Bd. The seasonal cycles exhibited by many infectious diseases are a reminder of the effects of climate on host-pathogen interactions, yet often the mechanisms that link environmental variation to epidemiological patterns are poorly understood. A clearer understanding of the links between climate and the outcomes of host-pathogen interactions is needed to predict and mitigate the risks that infectious diseases pose to humans and other organisms. 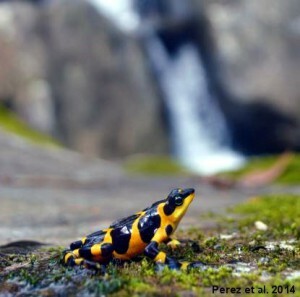 Our research is contributing to this aim by clarifying the mechanisms by which climatic variation shapes the risk of chytridiomycosis in amphibians. More broadly, our work also demonstrates how the integration of lab, field and modeling approaches can provide important insights into the mechanisms that link the impact of infectious diseases to environmental variation. During a Bd epidemic in Panama, we found that odds of infection decreased with increasing host body temperature, suggesting that even a slight increase in temperature can reduce a frog’s vulnerability to Bd (Richards-Zawacki 2010). 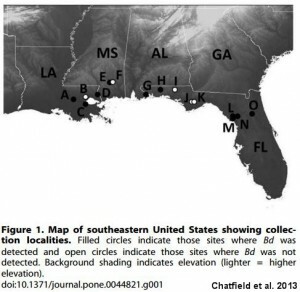 This and subsequent studies involving North American hosts suggest that negative effects on amphibian communities exist even where the pathogen is endemic and infections are sub-lethal (Chatfield et al. 2013, Perez et al. 2014) and that temperature greatly affects this host-pathogen interaction (Chatfield & Richards-Zawacki 2011). Our ongoing work aims to clarify the effects of climate on Bd dynamics in North American hosts. Our focal host species include northern cricket frogs (Acris crepitans) and leopard frogs (Lithobates pipiens and L. sphenocephala), all of which were once common throughout their range but have recently experienced declines, possibly due to Bd. We aim to clarify (1) the effect of temperature on pathogenicity and immune defense, (2) the effectiveness of a behavioral fever response in combating Bd infection, and (3) how the opportunity for thermally-mediated host defense varies in space and time. Ultimately, the findings of these field and lab studies will be integrated to develop spatiotemporal, biophysical models to predict where and when hosts will be unable to reach temperatures needed to combat Bd, leaving them susceptible to declines. A shift in virulence, or a transition away from the outbreak phase of a disease toward a stable co-existence of host and pathogen, often occurs following the emergence of new pathogens, yet the mechanisms that underpin such transitions remain obscure. During recent surveys in Panama we have observed what appears to be the beginnings of population recovery in several amphibian species that were thought to have been driven to local extinction by an epizootic of chytridiomycosis that occurred there in the mid-2000’s. As a result, a new and exciting direction for our lab, beginning in 2014, has been an investigation into the evolution of virulence in the amphibian-Bd system. Collaborators on this project include Dr. Jamie Voyles (University of Nevada, Reno) and Dr. Bree Rosenblum (UC Berkeley).